In 1975, as I was driving home from Santa Monica City College after attending a photography workshop, a rainstorm broke into it's sunshine. I was heading west waiting at a traffic stoplight when I spotted a huge rainbow as I glanced in my rear view mirror. Cruising around near Venice Beach, I was searching for an ideal foreground and place to record it with a complimentary surrounding environment. I headed for the Pacific Ocean. All that time I remembered, if a storm cleared around 4:00 o’clock, when facing east, there might be a chance a rainbow would appear. I parked my car, rushed to the beach and shore for a clear view of the sky, only to be interrupted by a man standing in the sand flying an assortment of stunt kites juxtaposed by the adjacent arch of colors in the distant clouds. After recording him, the kites, near by beach neighborhood in the mid-ground and the rainbow, he set his kites down. While interviewing him, coincidentally I discovered he owned the, “Rainbow Kite Company.” Inadvertently his studio was located across the street from my studio-home. 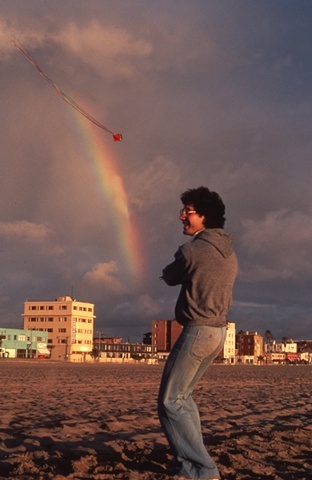 He was Steve Edeiken the renowned inventor, designer and builder of Rainbow Kites. Ref: rvmann.com/artwork/2655317-Go-Fly-A-Kit? Steve lost his life in a freak accident flying the world’s largest stationary-foil-kite. The lines wrapped around him as a surprisingly forceful wind swept them high in the sky then recklessly dropping them to the ground. It was a tragic way to meet one's end. www.flickr.com/photos/kiteaddict/330176? www.youtube.com/watch?v=y5JicO2bKec&? I tear up every time I see this video. My mother would sing "Over The Rainbow" and Nat King Cole's "Nature Boy" over and over again to get me to go to sleep, while I lie in my crib when I was an infant. Shaka to Iz and Steve who have given us a wealth of enjoyment . . .